Established in 2005, we are a family-run independent business, offering a genuine 24 hour emergency service, whether you are locked-out, locked-in or have been burgled and want your locks changed for peace of mind. Alternatively we can attend at your convenience. Our service is available to domestic and commercial customers. Our engineers are City & Guilds Qualified and DBS checked. We carry a wide range of parts - enabling us to complete the job on a single visit for your convenience in the majority of cases. We use up-to-date lock technology. We can repair and replace locks on all kinds of doors, whether it’s a wooden or uPVC door. We stock 3-star anti-snap cylinders to ensure that your locks are long-lasting and your property is as secure as it can be. We can advise on the most appropriate locks to ensure your property is secure and complies with your insurers requirements. They will be my go to from now for further work! Tim turned up as arranged, listened to what we said about the fault and how it had happened, and quickly diagnosed what was wrong. He was actually able to repair the fault, rather than us having to purchase a replacement. He also offered sound advice, and reassurance that we had suitable locking arrangements in place. Whilst with us he also serviced the second, Yale, lock - all within the standard charge. 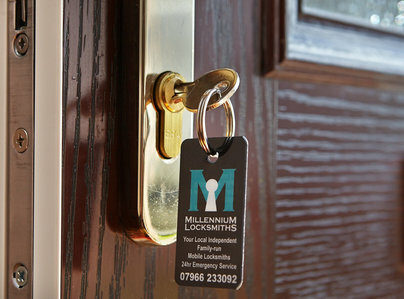 Having found Millennium Locksmiths, they will be our first port of call in the future, and we have absolutely no hesitation in recommending them highly (and, as it happens, we have already done so). Very pleased with the service provided, very polite and efficient. He turned up as arranged, was very smart and presentable, spoke well. He was very knowledgeable and resolved my problem quickly. Speedy, fast, honest and great workmanship and advice. Millennium Locksmith investigated a occasionally sticking lock on our UPVC back door. Explained clearly why the sensible solution was to replace the lock. This was carried out quickly from parts in hand and fully tested. Tim was friendly and easy to deal with. Tim completed repairs to UVPC windows, and updated locks. He was courteous, informative making suggestions as necessary. He did an excellent job and we are happy to recommend him. Millennium Locksmiths replaced a faulty lock mechanism on a front door, which prevented us entering our house when we returned from holiday. We were given advice by phone and Millennium visited and completed the work quickly and professionally. Highly recommended service. Responded to call out request promptly. Gave good advice and was very quick efficient and helpful. Excellent call out timing. Very professional and friendly service. Excellent. I would recommend to anybody.